The Complete Works of V. M. Straka | Thoughts On "S"
A torn page from Miracle at Braxenholm was on the first Santorini Man in 1936 (p74). EOTVOSWHEEL.COM says the page was from The Black Nineteen. A torn page from the Dutch edition showing pp 153-154 was found on the 10th Santorini Man in May, 1946 on Abaco Island, The Bahamas. A torn page from the Spanish edition showing pp 155-156 was found on a second-wave (the 17th) Santorini Man in Quepos, Costa Rica in April, 1971 (EOTVOSWHEEL.COM). A torn page from the French Edition showing pp 179-180 was found on the second-known Santorini Man in March, 1937 in Shizuoka, Japan. Florence Stoneham-Smith (1904-1983) at age 10 claimed she had written the first two novels attributed to Straka, which included The Cordillera (EOTVOSWHEEL.com). The phrase They radiate an unmistakable potential – and perhaps even a taste – for violence on p75 of Ship of Theseus is also on p88 of The Square, verbatim. The policeman’s grip on the cudgel on p95 of Ship of Theseus is also shown three different ways in The Square on pages 63, 101, 119. A torn page was found on the third Santorini Man in December, 1937 in Namibe, Angola (EOTVOSWHEEL.com). The Painted Cave was written by someone with detailed knowledge of archaeological sites in the south of France. The Painted Cave was published shortly after Guthrie MacInnes’s book The Unseen Battalion was published, complicating the idea that MacInnes was Straka (EOTVOSWHEEL.com). A torn page was found on the 8th Santorini Man in April, 1944 in Burnie, Tasmania (EOTVOSWHEEL.com). Appears to have taken place in the Santa Ana mountains (see Fn14 p349 along with the origin of the term santana as meaning Devil). This is the only work of Straka to be made into a movie, and Straka himself disagreed wholeheartedly with the adaptation (see marginalia and insert between p vi & vii. See also comments about Lewis’ Looper causing problems on the set of this movie in his section of the Straka Candidates on EOTVOSWHEEL.com. A torn page from the German Edition showing p89-90 was found on the 12th Santorini Man in July, 1949, in Rio Grande, Brazil. It’s deep philosophical underpinnings lend credence to the idea that Guthrie MacInnes was VMS. It is compared with Coriolis and Ship of Theseus (EOTVOSwheel.com and marginalia, p145). A torn page (p9-10) from the German Edition was found on the fourth Santorini Man in April, 1939, in Antofagasta, Chile (EOTVOSWHEEL.com). The main bad guy was named Hjaarn, which mirrors (pun intended) the monster in Stenfalk’s campfire story (p145). Jen thinks Triptych of Mirrors was one of the worst works of V.M Straka (p145). S asks Maelstrom if Sola, Samar, and Szalome are all the same woman. Eric notes that this may be a reference to Triptych of Mirrors and comments on the Island of Threefolds mentioned in Coriolis (p269). It was a flop (p182). Marginalia discussing the book’s financial woes and its likely contributions by MacInnes happen to occur on the same page that VMS focuses on the three fingers affected by touching the Black Vine substance – index, middle ring. It also mentions that S is dealing with pain in three toes (p182). Jen writes in the marginalia regarding Guthrie MacInnes: Vainest, Guy, Ever right after referencing Triptych of Mirrors. Eric replies Holder of Biggest. Grudge. Ever (p182). The setting of The Spotted Cat is Nazca, Peru and involves the famous Nazca Lines (4). It also appears to have been written by someone with extensive pirate knowledge (EOTVOSWHEEL.com). Eric struggles with the relevance of Fn6, p55, regarding the priest’s monologue in Part IV. Jennifer Heyward was reading The Spotted Cat in the Pronghorn Java when she “spotted” Moody and Ilsa (p90). Though there are no known pages from this book on a Santorini Man in the first or second waves (the first 19), there is a page on the first of what may be the third wave – p145-146 (or p233-234) of the Japanese edition in October, 2011 in Barcelona, Spain (EOTVOSWHEEL.com). It deals with the massacare of 1919 in Colonial India. A torn page was found on a second-wave (the 18th) Santorini Man showing pp 109-110 in Dickson, Russia in February, 1974. A torn page showing p9-10 from the Spanish Edition was found on the 11th Santorini Man in October, 1948, in Udupi, India (EOTVOSWHEEL.com). Chapter 26 closely mirrors the scene in Ship of Theseus as S tries to decide what to do about poisoning the wine and thinks to himself Can it possibly matter what one man wants? Read this interesting commentary for more. A big thanks to @anabramsfan for helping me compile all this information. 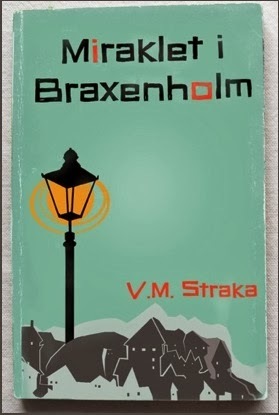 “Braxenholm” is likely an Easter egg nod to JJ Abrams. In Swedish, “braxen” means “bream,” a kind of fish comprising several genera, including Abramis. I like that idea. Holm is more of an islet – something small in a river. But you could be right. I have wondered if it might refer to one of the islets in the Vltava downstream from the Charles Bridge where the swift waters may have carried Vaclav as Ekstrom was rescuing him. Maybe they crawled ashore there and Vaclav “came to the light” with that miraculous rescue. Like Stvanice. Dang, dude. Good catch. On both comments. “Emydio” means “demigod,” according to some sources. I have not been able to find an authoritative source for this, but it makes sense: hemi+deo. Winged sandals are most commonly associated with Hermes (as in Hermes Bouchard), the god of commerce–and thieves. And tricksters. I don’t know if that helps, but there it is.